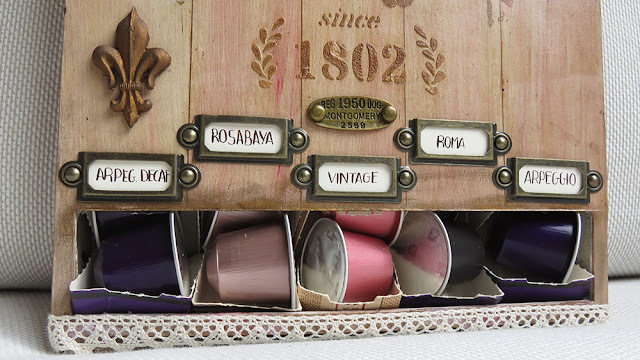 If you are a coffee addict like me, then this post is certainly not only practical, but beautiful to boot! As we embark on a spring bank holiday weekend here in the UK, this is the perfect project to enjoy your extra day of free time! Today I’m bringing you a project that I wanted to do for months: a nespresso capsule holder! Well, at home I was not the only one craving to get it done… I had created a card stock base using a cereal box, cut it and resized it to fit 5 boxes of nespresso capsules (measurements at my blog) and painted with white gesso that had been wandering around the kitchen for some time (it was even a bit dirty with coffee splashes… If I had given it a little more time it would have decorated itself completely! hehe) I was being chased by my boyfriend to actually finish it and finally hang it from where it should be. 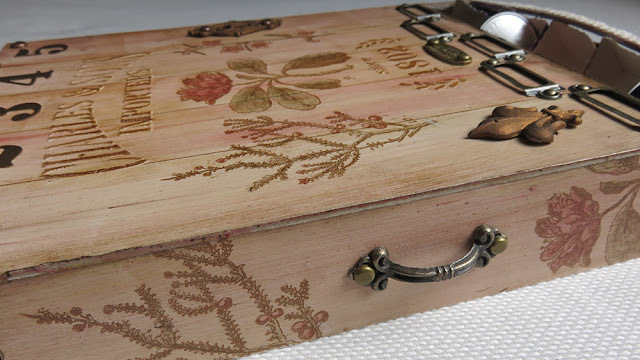 So when the new topic #7 Found Object was announced at PaperArtsy blog, it seemed the right time to complete this project. I really enjoyed the project and I believe that the fact of playing around with found objects helped me to give it the right shape. It's plenty of embellishments but I believe I managed to make them coordinate. What do you think? 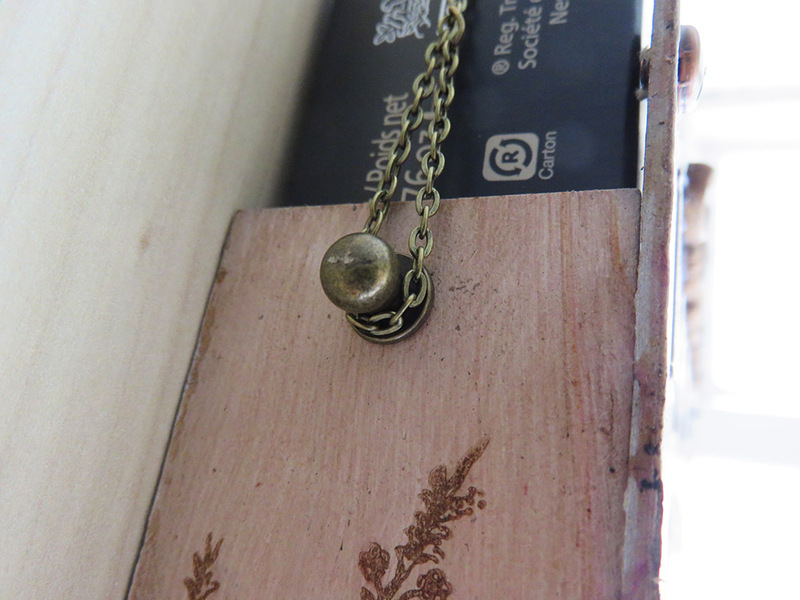 I’ve incorporated different found objects, like the bulb which I kept for some reason (it was so cute and tiny and it seemed it could still work as a bulb) but I never thought I would incorporate it in any crafty project, I also added a handle for a jewellery box drawer and also some brass chains that I normally use to create jewellery and which help me to hang the capsule holder from the Chicago screws (or however those Tim Holtz’s screws are called…). 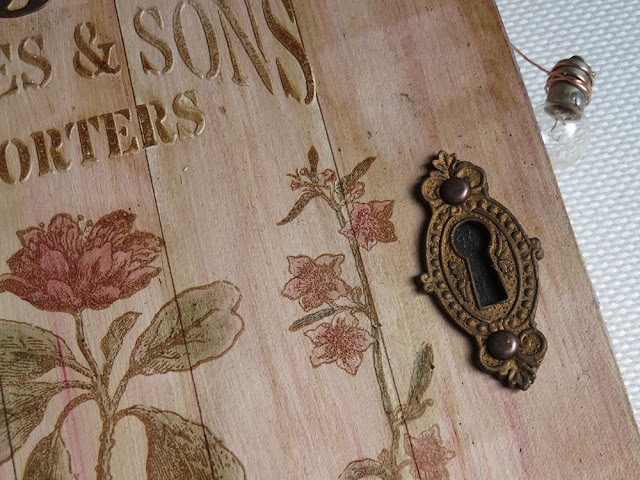 I’ve also incorporated other objects, not found but created by me like the key hole and filigrees. I used some moulds that are actually to create sugar decorations for cakes but they did the trick. I got inspired by Jennie Atkinson in using Paper clay, it was my first time using it and I can tell it will not be the last one. The results are great. 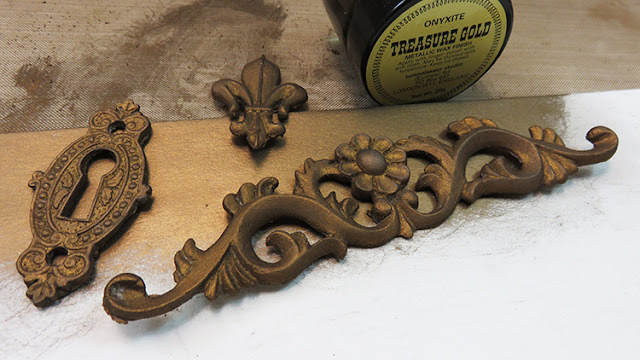 I just painted the Paper Clay with some treasure gold (onyxite), it seems just like real metal! And I used treasure gold for the numbers too: I painted a card stock and then I die cut the numbers, they really seem like metal and they coordinate with the other elements perfectly. I originally wanted to create a dark brown background, because this is to hold coffees, but since I’m in love with Rusty Car Infusions and the wood effect that I can create with it, I went for a more light tone and I feel that it was the right choice. 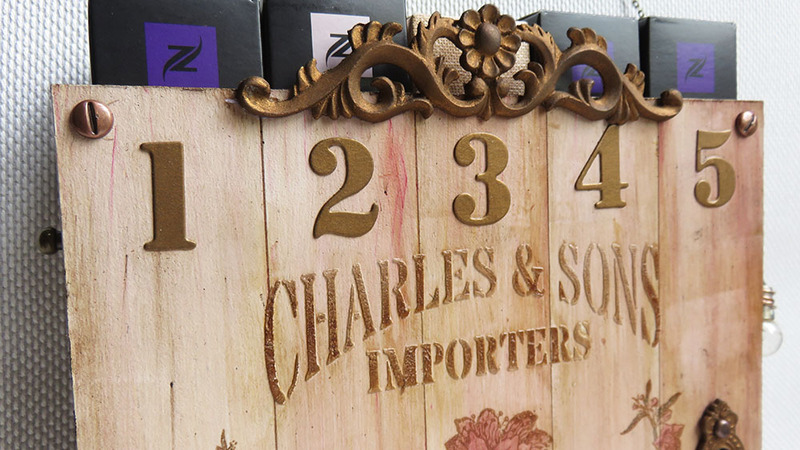 I didn’t paint my box directly, I created 3 panels (front and two sides) in grey chipboard which I painted with fresco paint Nougat and then decorated it before attaching it to the box (all measurements in my blog). I divided the main front panel in 5 by painting 4 division lines with a permanent fine liner in brown and painted each panel independently with Rusty Car Infusions and Satin Glaze and by masking each section with post it notes, as you may have seen me doing for the crafting at ally pally make and take. 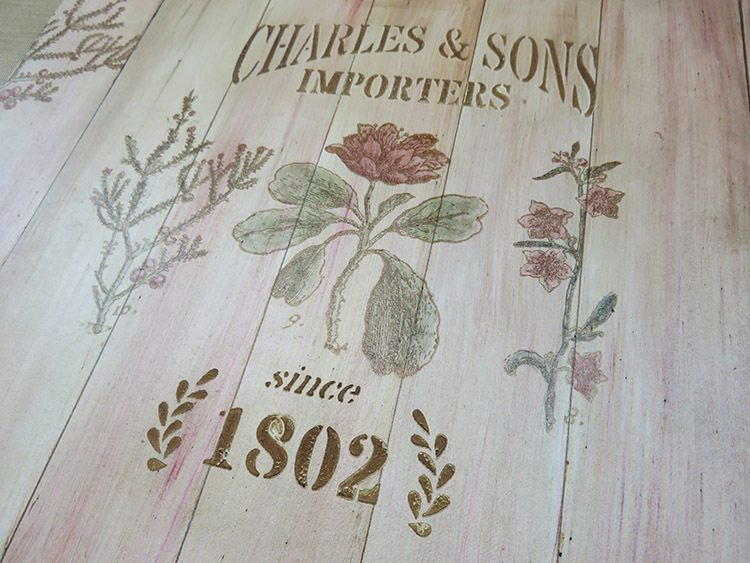 ...which was very convenient for this project, it was about importers of TEA, but for me now it was about coffee, so the part that I stencilled with grunge paste - just great in the project. I painted the stamps (stamped with Versafine ink Vintage Sepia) with a mix of Satin glaze and Infusions (creating my own translucent acrylic paint), I used Olive tree Infusion for the leaves and Raspberry Infusion mixed with Rusty Car Infusion for all the flowers and fruits in the stamps. My bulb is attached in a very simple way, it’s just a copper colour wire that goes around the base of the bulb for a few rounds and then I use that same wire to keep it in a lamp-like position. In this case I just poked the hole in the grey chipboard and using a needle. I passed the wire through the hole and fix it with cello tape to the back of the chipboard. This is then hidden when I stick the chipboard panel to the cereal box. For the rest of decorations, the filigree, the Fleur de lis and the lace, I used a hot glue gun. And since the gun was still hot, I decided to use it to join the joints properly between the front panel and the side panels. That made my structure even sturdier. 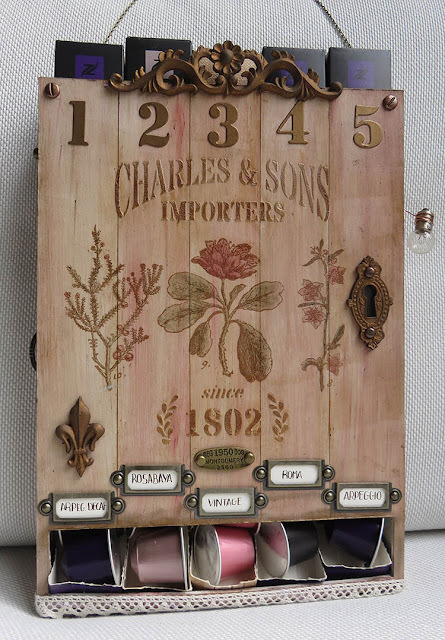 For the numbers I used modpodge. I'm still amazed at how shiny these are. My capsule holder hangs from the Chicago screws and I used a chain that goes from one side to the other. Then one string goes from the middle of the chain to my wall. This is easy enough to release in case I struggle getting the expresso boxes in or out. I’ve recorded a video with all the step by step process (except the creation of the base, which is in my blog with measurements, so I don’t overwhelm you here with too many info). This is a very, very long video but if you have time and are curious about how it was done, get some popcorn or a cup of tea, click play and enjoy! Well, I hope you had fun, you feel inspired and you want to try it yourself. On my side I'm very happy with the result and at home we enjoy our morning coffee even more. 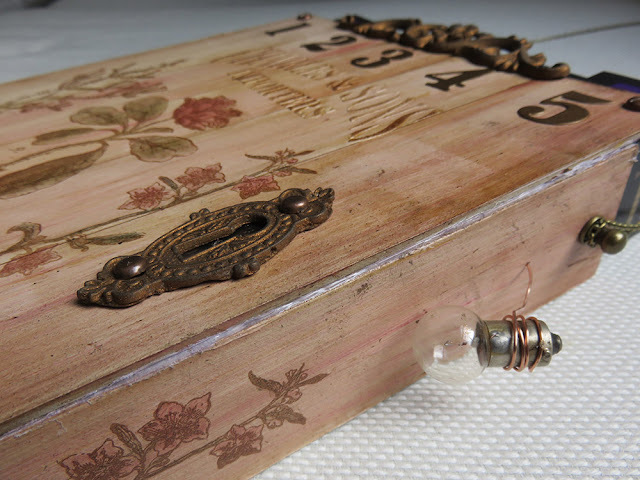 I'll definitely try incorporating found objects in other projects since I enjoyed the experience a lot and I finally found a purpose for some of those nice little treasures that I was keeping for no apparent reason. Have a look at the things you collect, I’m sure you have plenty of little items that would look great in a crafty project! The current topic link (Found Objects) will close 17:00 (London Time) Sunday, May 7th 2017, and the winner will be announced 2 hours later at 19:00.
what a fab project ! Amazing project! Love the lightbulb and all the details! That is wonderful! Such a great idea & I love the lightbulb. 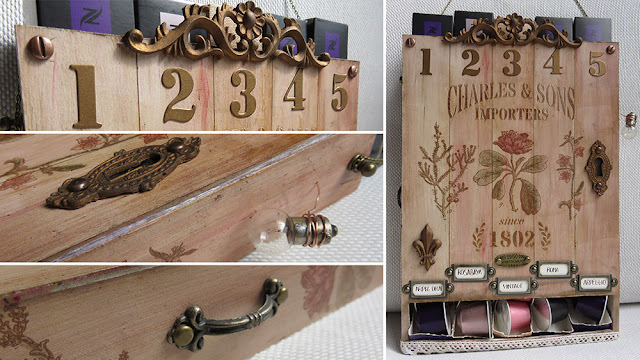 What a clever idea and so beautifully executed! 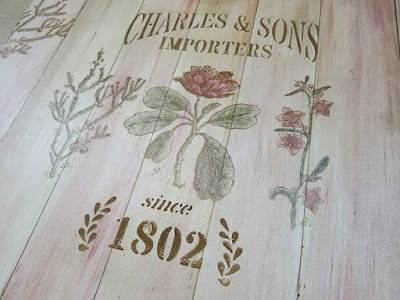 Beautiful, Raquel - I love the bleached wood look, and perfect combination of stamping and stencilling. Lovely rose blush colour palette too. 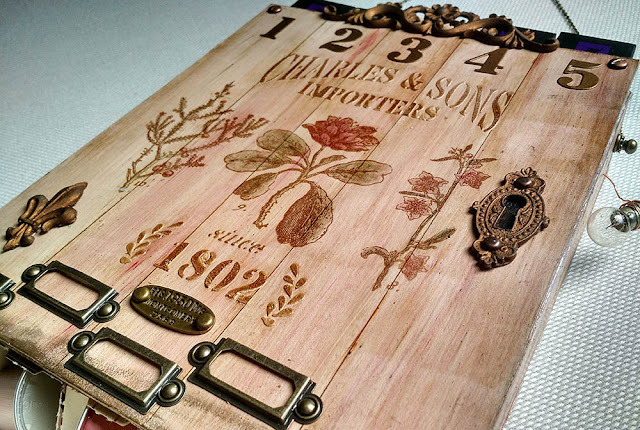 Beautiful wooden look and such a great recycling idea! 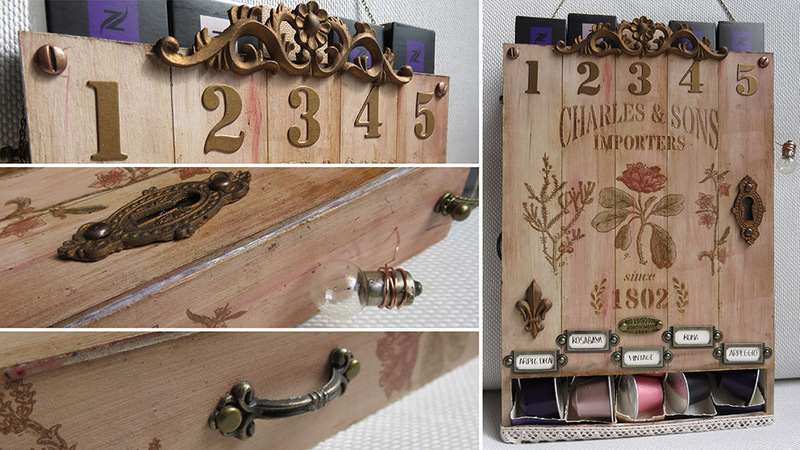 Such a lovely project - I really love this - and such a great idea!